“Amigo used to address to a friend, chiefly in Spanish”. This program is especially designed for University students, professors, corporate professionals, social workers, artists, business people and travel lovers. They will find this program in their budget and get maximum opportunity to know about real culture of India from an eye of an Indian Exchange participant. Why Exchange Program for Youth and How it works? “India is the youngest country in the world. Indian youth wants to explore their knowledge and share a platform with other youth of the world. This program “Amigo” (Close Friend in Spanish) is designed to understand whole economy, business, behavior, culture, education, health and other several issues to understand by working in ground level. This program will be one to one exchange program." Participant has to come to India for two weeks program. He/she will live with a participant’s house who will become guest to foreign participant for same duration. Host participant has to take care of guest with lodging boarding, local travel and spend good time as per Vishvet’s schedule and guidelines. Vishvet Coordinator will be there to ensure safety, food and living with best environment. Exchange participants will come to know about each other before commencement of the program. Duration: Up to two weeks during the year. Participant has to arrange "Travel Ticket + Medical Insurance + VISA charge + Pocket Money". Live with Indian Host Family, share kitchen and food culture exchange at home. Learn Indian delicious dishes. City tour, University and School visits. A nearby state or other places of same state visits. Social work at an NGO. Participation in a Social get together/ Indian marriage/ religious ceremony etc. Participation in a workshop for Yoga, Pranayam and Meditation. Workshop on basics of Indian language Hindi and Gujarati. Celebrate the Indian festivals in an Indian traditional way. Ahmedabad is a cosmopolitan metro city (Population 6,352,254 on 2011). It is adjacent to capital of Gujarat with consisting of all ethnic groups of citizens of India and world. Ahmedabad is the destination of all Automobile companies with consisting of plant of world’s cheapest price car “TATA Nano”. There are more than 15 international schools and well established education infrastructure available in Ahmedabad. Vishvet Foundation has trustworthy network of all private and public schools in Ahmedabad. Personal safety at Ahmedabad is always on priority by the Government of Gujarat. Ahmedabad is celebrating world’s biggest Dance Festival “Garba” for nine nights in the month of October every year. Ahmedabad is having all three seasons Winter, Summer and Rain with moderate conditions which is best for living throughout the year. Although anytime during the year is the best time but we suggests October to March six months are best to visit here. During this period you will enjoy Navratri in October, Diwali in November, Christmas in December, Uttarayan (Kite festival) and Saptak music festival in January and Holi in March. You can explore the nearest state Rajasthan in December month for colors and music. Indian school academic year is from June to March. April and May month are the summer vacation in schools in India. Participants have to start registration process 10 weeks before the program start date. 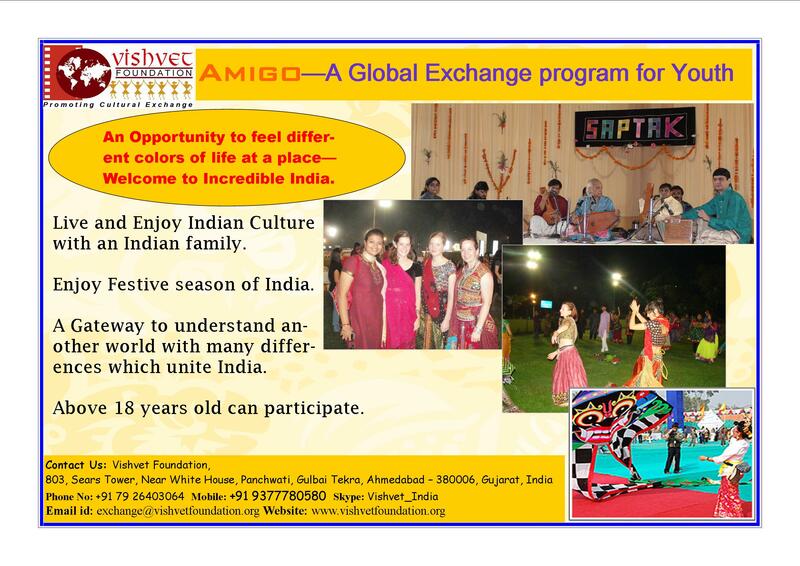 Participants will live with exchange participant’s home or a volunteer host family in Ahmedabad, Gujarat. Vishvet Foundation will give all support to participants from documentation to VISA related work. Exchange participant will come to your home country within 90 (Min.) to 180 (Max.) Days after your visit. Host and Guest both have to follow Vishvet’s Guidelines and sign the agreement on Application. Responsibilities of each, program schedule and other documentation related points will be discussed in an orientation program. Program is specially designed for the people who want to sense and feel real culture by involving themselves, with low budget travel & accommodation, want to taste food varieties. Never expect luxury treatment from host family. Be ready to adopt new culture with limited resources available. Show active and open to learn attitude during the program. Participant will be responsible for belonging items during the program. It is a wonderful opportunity for participants who want to explore the India culturally. Note: Vishvet foundation will make customization in program according to your requirements.